Ketan Patel, M.D., has been a member of Shields Radiology Associates since March 2004. Dr. Patel received his medical degree from Smt. N.H.L.M. Medical College, Gujarat University, Ahmedabad, Gujarat, India. He completed his internship at Gujarat University-affiliated teaching hospitals and his residency at Gujarat Cancer and Research Institute in India. Dr. Patel then came to the United States in 1994 and completed an internship in internal medicine at Staten Island University Hospital, Mount Sinai School of Medicine in New York and his residency in radiology at Bridgeport Hospital, Yale University, in Connecticut. He completed a musculoskeletal radiology fellowship at Wake Forest University Baptist Medical Center in Winston-Salem, NC. He is a diplomate of the American Board of Radiology. He was the Medical Director of MRI at UMass Memorial, CMMIC, and Assistant Professor in musculoskeletal radiology, which he continues to teach part-time. 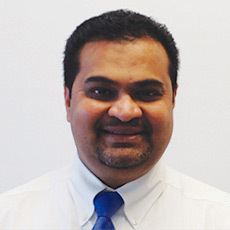 He was Chief Resident in the Department of Radiology, Bridgeport Hospital, June 2000-July 2001, and resident representative at Connecticut State Chapter, ACR, 2000. Dr. Patel teaches radiology to medical students, residents, and fellows at UMass Memorial Medical Center in Worcester, MA, and sports medicine fellows at Children’s Hospital in Boston, MA. Dr. Patel is a member of the Radiological Society of North America, American College of Radiology, American Roentgen Ray Society, American College of Physicians, American Association of Physicians of Indian Origin and American Association of Radiologists of Indian Origin. He received the RSNA Resident Research Award in 2000 and 1998. Dr. Patel has authored several publications; his most recent article is: “Radiology” Sports-Related Injuries of the Hip: Clinics in Sports Medicine (2011): 239-283.